Come and enjoy real Finnish experiences in lumberjacks's style in 50's. Visit the very large smoke sauna, have a delicious traditional dinner with Kuopio specialities, enjoy live accordeon music and even dance. "Traditional public Finnish evenings" are organised Tuesdays around the year and in summer also on Thursdays at Jätkänkämppä (jätkä = a lumberjack, kämppä = a lodge), which is an authentic lumberjack lodge from the 1950´s. The Jätkänkämppä is the pride of Rauhalahti and it is situated 600 metres from the Spa Hotel Rauhalahti. 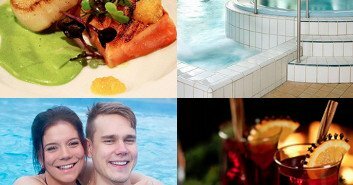 This event is selected as a top wellness product in Finpro’s Visit Finland Finrelax growth programme. See the bulletin here. In addition, Jätkänkämppä's smoke sauna was picked by Culture Trip as on of their Finland Local Favorites 2017. Read the article, 10 of the best saunas in Finland. ATTENTION! On Wednesday 2.1.2019 and on Saturday 5.1.2019 there is also possibility to bathe in the large smoke sauna at 16-20.. The prices:14 € / adult and 7 € / child 4-14 yrs old, hotel/hostel guests 8 € / adult and 4 € / child 4-14 yrs old. Package rate: smoke sauna + dinner 35 € / adult and 17,50 € / child 4-14 yrs. If you have a half-board package at the Spa Hotel and you want to have Jätkänkämppä's dinner buffet instead of the hotel buffet, you just pay extra 4 € / adult and 2 € / child 4-14 yrs. Lumberjack heritage is cherished at Jätkänkämppä by preserving photos and tools that depict those bygone times. Read more about Jätkänkämppä's history here. How to arrive in Jätkänkämppä? Read more here. If you want to reserve Jätkänkämppä and/or smoke sauna for private use, read more here. Prices the same as above in winter/spring period. Lumberjack's demonstrain in summer time 4.6.-29.8.2019 every Tuesday and Thursday at 18.00 and 20.00.